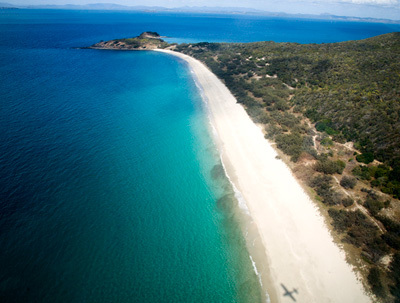 Great Keppel Island lies approximately 15km off the coast of Yeppoon, near Rockhampton in Central Queensland. 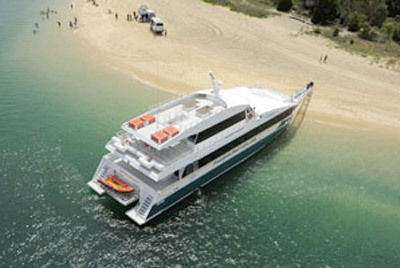 Freedom Fast Cats operate a ferry transfer service to and from Great Keppel Island daily (excluding Mondays). The ferry departs from Pier One at Rosslyn Bay Boat Harbour in Yeppoon and takes around 30 minutes to get to the island. Timetable effective from March 2014 to March 2015. If you are driving to Rosslyn Bay, we recommend that you park your car at the Great Keppel Island Security Carpark, located just before the turnoff to the harbour. A courtesy bus service is provided between to and from Pier One. Visit the Freedom Fast Cats website for ticket prices and other info. Peace Aviation operate an efficient air charter flight service to Great Keppel Island from Rockhampton Airport for very reasonable rates. The scenic flight to the island takes around 20 minutes and is a really special and exciting way to get to the island. Visit the Peace Aviation website. Have your own boat? There are boat ramp and marina facilities available at Rosslyn Bay Boat Harbour in Yeppoon. Take the short trip across the waters of Keppel Bay to Fishermans Beach on the island. Fishermans beach is a popular anchorage and is generally well protected from prevailing winds. Mooring facilities can be provided on request. Which ever way you travel to the island, we will greet you with our vehicle to transport your luggage and guide to you the Lodge.